The Newage NB-3010 is an ideal solution for lab and medium volume Brinell testing applications. 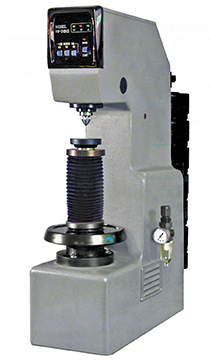 This tester is used for determining the Brinell hardness of un-quenched steel, cast iron, nonferrous metals and soft bearing alloys. The NB-3010 measuring range is 8 – 650 HBW using a tungsten carbide ball indenter. The NB-3010 applies precise loads using a deadweight design. A pneumatic cylinder ensures that the load descends smoothly without an impact effect, and that the deadweights return after the test. A 60 psig air regulator using clean, dry air is required. Deadweights are used for applying up to eight different loads from 187.5 kgf to 3000 kgf. The NB-3010 also features a semi-automatic test procedure which is easy for the operator. The operator simply raises the elevating screw until the specimen makes contact with the indenter. At the press of a button, the load is applied and removed after a pre-defined dwell time. Time-at-loads of 12-, 30- and 60-seconds are permitted and each time period has a dedicated pushbutton further simplifying operation. Once the impression is made, you can use a Newage Brinell scope or our B.O.S.S. system. The B.O.S.S. system is supplied standard on the NB-3010-LB model. This computer-based system displays tests on your computer, stores your test results electronically and can print SPC reports. This automated system reduces operator influence on test results. Pushbutton controls ensure proper loading and dwell time. Precision dead weights apply load automatically without impact effect. Requires minimum operator monitoring. Economically priced, yet rugged. High-quality materials and construction. Request more information to see how we can help you with a Brinell testing solution that suits your need.Request more information to see how we can help you with a Brinell testing solution that suits your need.